The hoops I had to jump through to get this posted to the site today. Oh, hey, don’t forget I’m still looking for your comic industry predictions for 2014…I don’t mind some gag predictions, but try to give me at least one serious one, too. Remember, limit three per person, please! 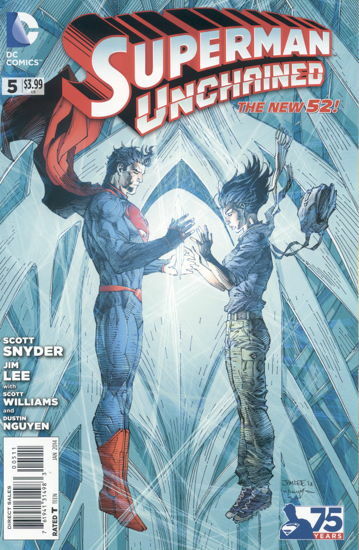 Here it is, the inevitable “main story partially drawn by another artist” issue of Superman Unchained , but at least it’s done in an effective way, having said guest artist (Dustin Nguyen) illustrating the flashback sequences to Clark’s youth. And there’s a particularly effective sequence later in the book, where Superman is asked to imagine his future as the world ages (and friends die) around him, and it’s quite sad, really. It’s a rare moment of genuine emotional connection to the character in this post-New 52 world. In fact, and I’ve noted this before, the Superman line of books seem to be undergoing a mini-rebirth lately, more entertaining, more engaging. It’s like Superman comics are allowed to tell Superman stories again, instead of presenting a parade of creative teams trying to make top-down editorial mandates somehow work in a narrative. Even marketing ploys like Superman/Wonder Woman and Superman/Batman have turned out to be, surprise, pretty good reads. I’m even beginning to learn to live without Superman’s trunks. But still, that collar is terrible, and has to go. I was a defender of the New 52 Aquaman at first. Well, still am, I suppose. I didn’t mind that the book went with the “no one takes Aquaman seriously” angle, a bit of metatextual repurposing of the usual fannish criticisms of the character. I did mind when the book started dealing with some kind of super-team that Aquaman was involved with (no, not Justice League, some other one) and I don’t even remember the details now, but suddenly I wasn’t enjoying the book and away it went. And just in time, too, because then there was some crossover with Justice League , which I wasn’t reading, and, well, that was that. Which was a shame, too, since I’ve generally been following most the Aquaman comics over the last thirty years, beginning with this series and lasting up until the beginning of the most recent pre-New 52 iteration, where I finally decided that, like Flash and Legion of Super-Heroes , I’d read pretty much all the Aquaman I ever needed to read. 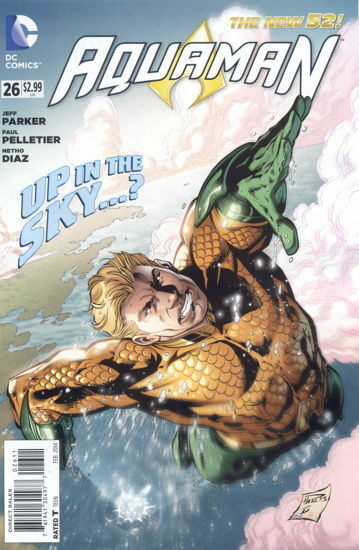 With this new issue, Jeff Parker is on board as writer, and having enjoyed pretty much everything Mr. Parker has written before, that was enough incentive to dip into the Aquaman pool once again. There’s plenty of underwater monster-fightin’ action, and it’s fun, and thankfully continuity-light, so if you haven’t read the series prior to this point, no worries, you can jump right in. This is pretty close to the kind of Aquaman comic I’ve been wanting over the last few years, and I hope it’s rewarded with enough sales and readership to encourage DC to persue similar strategies with other properties of theirs. So this two-issue series involves Lord Baltimore finally confronting the vampire who killed his family, the one he’d been chasing after in the previous, um, lemme look inside the front cover here…eighteen issues of previous mini-series. For some reason, I briefly thought maybe this would be the end of the line for the Baltimore comics, with one of the Mike Mignola-verse series actually reaching a conclusion. However, the letters page in this issue does confirm further Baltimore projects, so either that darn vampire scoots away, or Baltimore finds a new hobby after the end of this story. 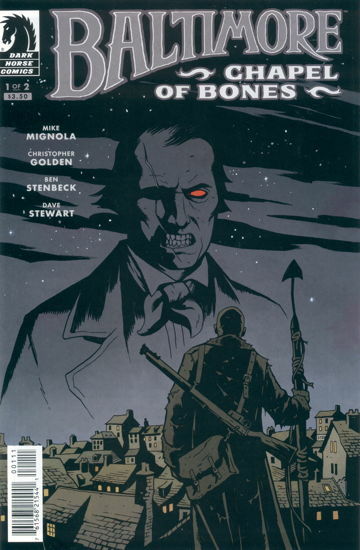 It’s not that I want this series to end…I enjoy all of Mignola’s horror work, but I am curious as to how he sticks the landing on any of his long-term projects. I believe it’s been said that he has an ending for Hellboy in mind, and though Hellboy in Hell is the Hellboy series for the time being, I don’t know that this is also the last series. B.P.R.D. 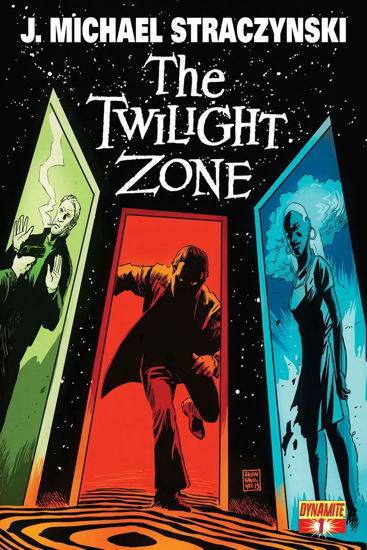 is a series that could probably benefit from an ending, wrapping up some of these plotlines and supporting characters and such and starting afresh, since I don’t see too many new readers jumping into the storyline at this point. Abe Sapien just started, though I could see this becoming Abe Sapien and the B.P.R.D. at some point, which would nicely replace the ongoing continuity-heavy B.P.R.D. as long as I’m telling publishers who don’t care what I think what to do. Anyway, Baltimore . It’s good, and it does look like we’re getting our final battle with this vampire. I’m sure whatever direction this series continues in after this climactic moment will be just as creepily entertaining, and I look forward to it. Here’s a book I wanted to like more than I did. Not that it’s bad, by any means…it’s certainly intriguing, but it hasn’t quite grabbed me yet. There’s a bit of business with the ghost-boys worrying about Death eventually coming back for them and taking them to their final reward, so I suppose that’s going to be a thing hanging over them ’til the eventual “ Sandman family characters guest-starring in this issue!” issue. 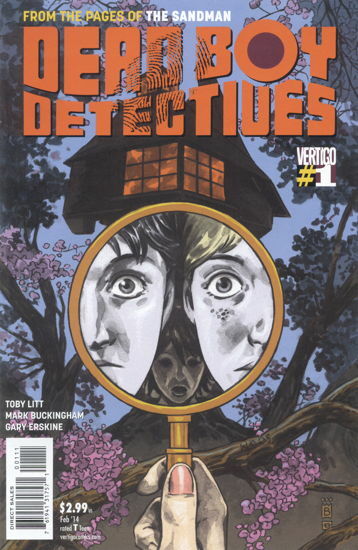 Most of the book is about introducing a new character to the mix, and it seems the next issue will have her at the same school the titular spectral Sherlocks were themselves murdered. Thus I expect, now that we’ve got the introductions out of the way, I’ll be fully on board once the plot is in motion. 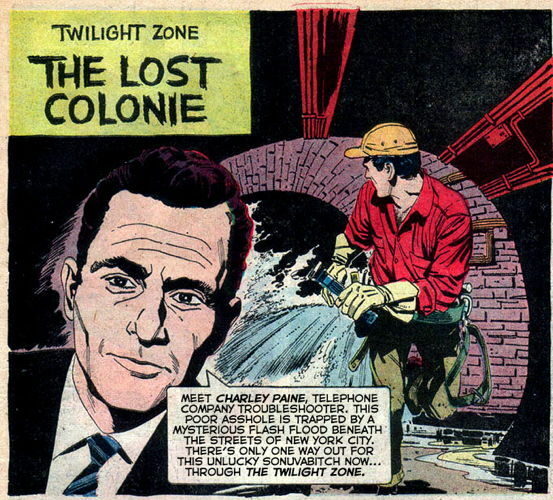 Slightly altered Twilight Zone panel courtesy Evil Bully. …It’ll all make sense once you read that #1. Did you read (and/or like) the OYL Aquaman series, with the kid who was going to be the next Aquaman and the guy who was clearly out Aquaman turned into a Cthulhu mutant and the whole thing really smacked of ‘well, this isn’t going to last’? Or is that the pre-52 story you refer to where you kind of decided you’d had enough? he’ll hunt the Frankenstein Monster! then the Mummy! then the Wolfman! then Abbot and Costello, and everyone will say the series jumped the Shark! I jumped OFF because it got too confusing and tiresome. If she hasn’t gotten to it by NOW I think they’re safe!